A Symphony of All-Natural Ingredients! Arnica, a sunflower extract, is a key ingredient and the reason your lips feel rejuvenated as soon as you put ChopSaver on. natural ingredients, 10 of them certified organic. The healing properties of herbs such as arnica, calendula, comfrey and white willow are combined with nature’s finest oils and moisturizers including shea butter, mango butter, avocado oil, apricot oil, grapeseed oil, aloe, Vitamin E and a light fresh citrus fragrance. 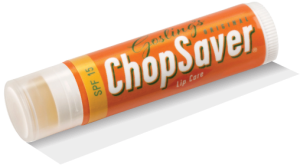 For outdoor use, ChopSaver with SPF 15 adds sun screen for Broad Spectrum (UVA and UVB ray) protection. This is achieved with four FDA approved sunscreens – avobenzone, octinoxate, octisalate, and octocrylene. Both products have the same soft feel and fragrance. 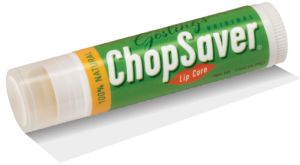 Try ChopSaver today and you’ll never go back to regular lip balms!